Rapidough is a great game from Drumond Park and one that you can involve the family in. You have two teams and it’s up to you how many on each team and you can have uneven sizes to perhaps allow for a younger player. It’s recommended for players age 8+. 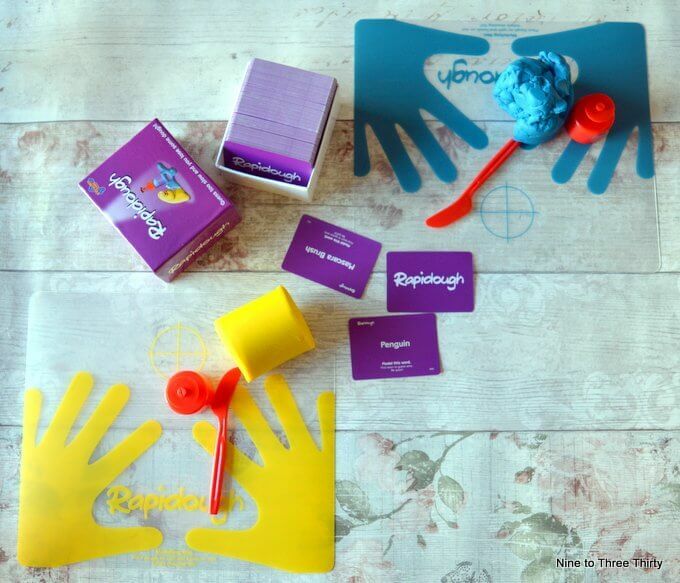 Rapidough is the original game of modelling charades that has recently been thoroughly refreshed to provide many hours of fun with family and friends. It’s a game full of fun and everyone plays at once so there’s no time to get bored. You are either making or guessing. We round it can get rather noisy and excited as every one tries to guess. The Modeller in each team takes a card and then attempts to sculpt the word or words shown into a shape, as their teammates begin their frenzied attempts to guess what’s emerging from the coloured modelling dough. Guess too slow and you lose some dough, leaving you with less to shape your word next time around. In each round, the first team to identify what’s been modelled correctly is, of course, the winner. There’s a sting in the tail of course… at the end of each round, the losing team has one ‘plug’ of dough taken away from them. The game ends when one of the team runs out of dough, so the other team wins. It’s a really simple game to understand and play, but the creativity isn’t limited at all and your imagination and skill can come to the forefront. If you’d like to win a copy of the game (worth £27.99), enter via the Gleam widget below. Sounds like a fun game. Would be great for this time of year, providing a fun game/ activity for wet weather outdoors, so time spent indoors. This looks like a great family game. Playdough is a hit with my twins! I’ve wanted this game for ages, it looks so much fun! Thanks for the great prize and competition. This looks like fun! This looks like such a fun game especially the modelling, Also I never knew you had a food blog! My nephew loves play doh based toys, he would love this. My Two Boys would love playing this game! My Son has already got this one on his Christmas list! What a lovely prize – I would love to play this with my grandchildren. This game looks brilliant – would love to win for Christmas! Thanks for the review and giveaway. Have added Rapidough to my Christmas shopping list. sounds like a good game for xmas. We played this at a friends house last year and laughed for hours! We’d love the game for home! My girls would love to have fun with this.